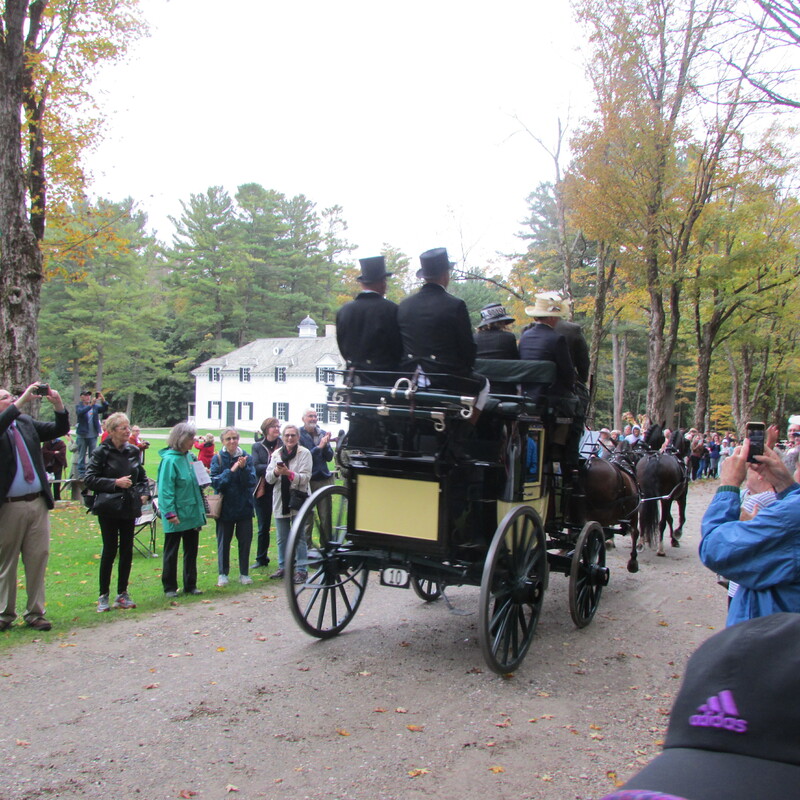 The Coaches coming through the main gate at Edith Wharton’s home, The Mount during the Berkshire Coaching Weekend. 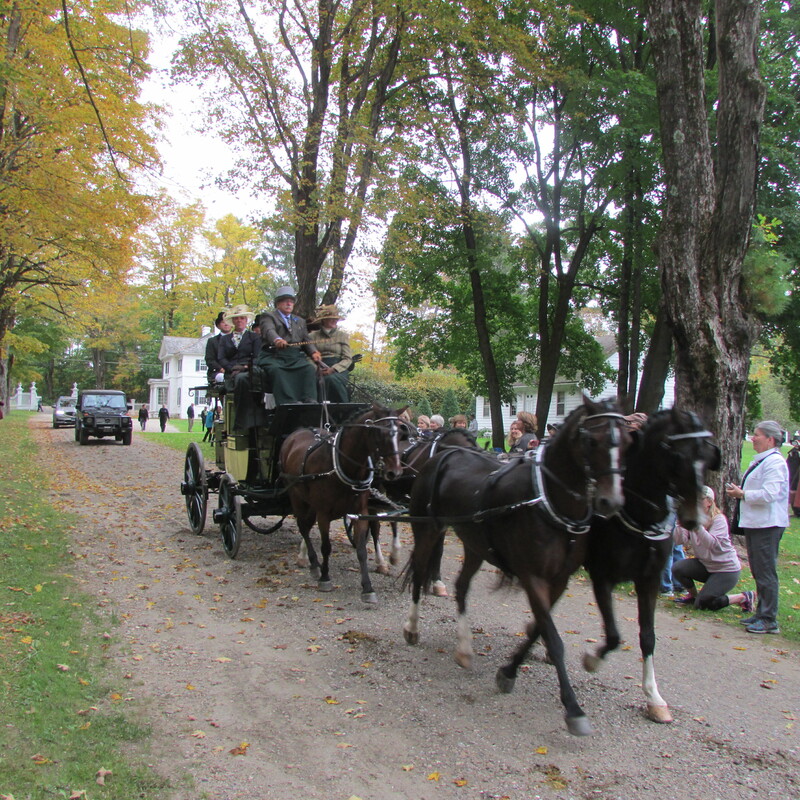 One of the visual high-points of the Columbus Day Weekend in Lenox and Stockbridge, which are located in the Berkshire Mountains of western Massachusetts, other than the gorgeous Fall foliage, is the sighting of road coaches traveling through those towns and on country roads that connect them. The Berkshires, also known as the Inland Newport, as in Newport, Rhode Island, was a place during the Gilded Age (1870 to about 1900) where fabulously successful men from places like New York City, Boston and other locations, and their families built opulent country homes, that they called “cottages”. People with surnames like Vanderbilt, Astor, Fields, Morgan, Carnegie and Westinghouse, among others, erected great estates where they emulated the lives of European aristocrats for just a few weeks each year. One of the hobbies of those “Summer Colonists” was driving coaches and carriages. 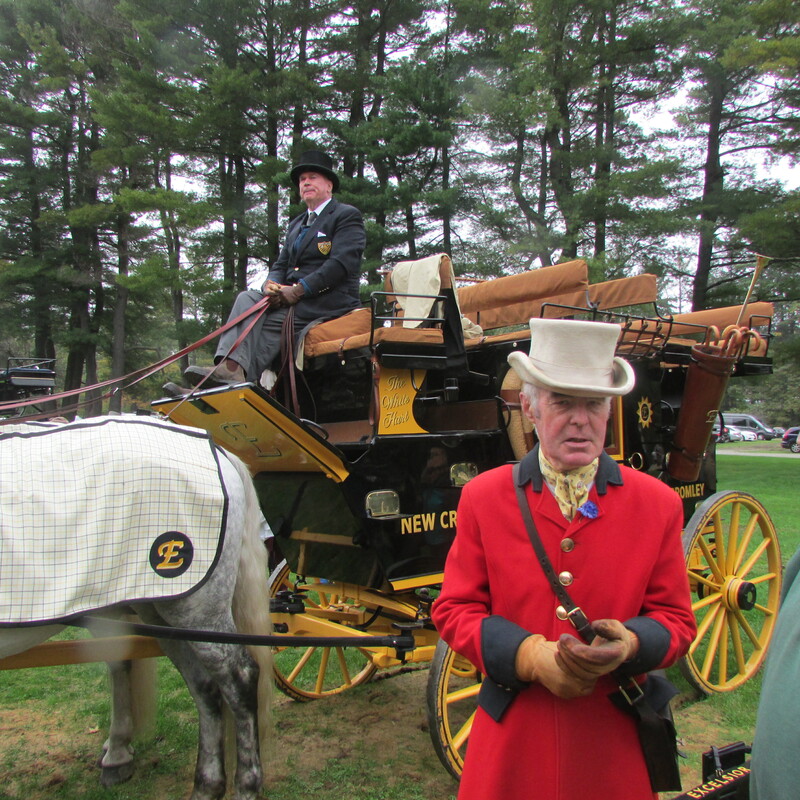 This year, for the ninth time, members of the New York Coaching Club and Four-in-Hand Club of America came together for three days of “drives” reenacting the glorious days of the Gilded Age that have long gone by. All three days of the coaching weekend started out at the hosts of the event, Harvey and Mary Stokes Waller’s Orleton Farm in Stockbridge and the drives proceeded out from there. The first day of driving brought the coaches to Elm Court, built by William Douglas Sloane and his wife Emily Thorn Vanderbilt in 1885. Their Berkshire cottage was designed by Peabody and Stearns and has 106 rooms. Elm Court is the largest Shingle Style house in the United States, and is done in the Tudor Revival Style. 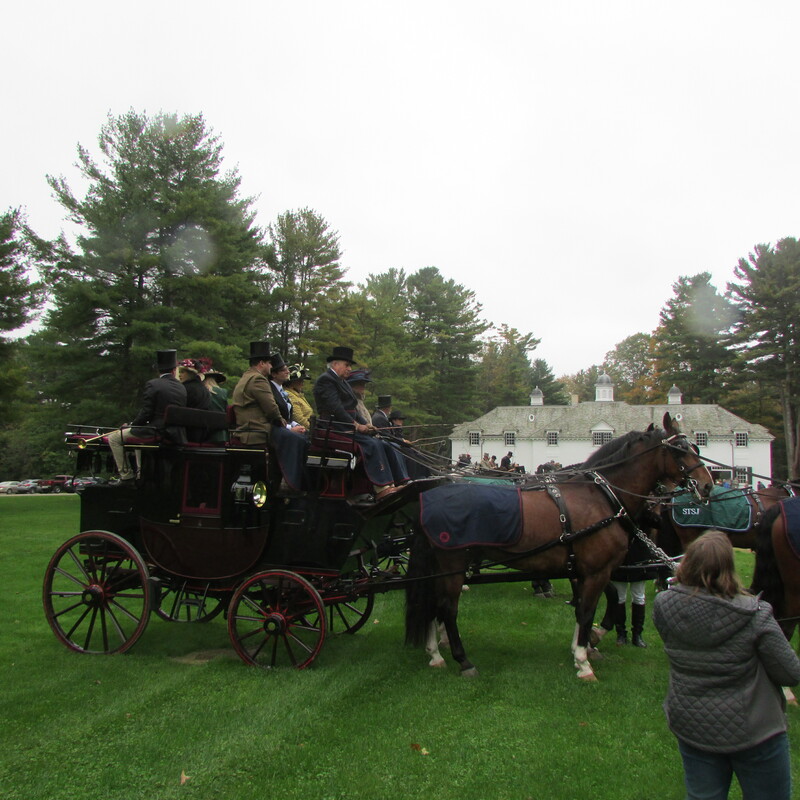 The second day of coaching brought “Whips” drivers of the coaches and their guests through the picturesque village of Stockbridge, home of the famous artist/illustrator of Saturday Evening Post covers Norman Rockwell, and they proceeded to a private estate where they had lunch. 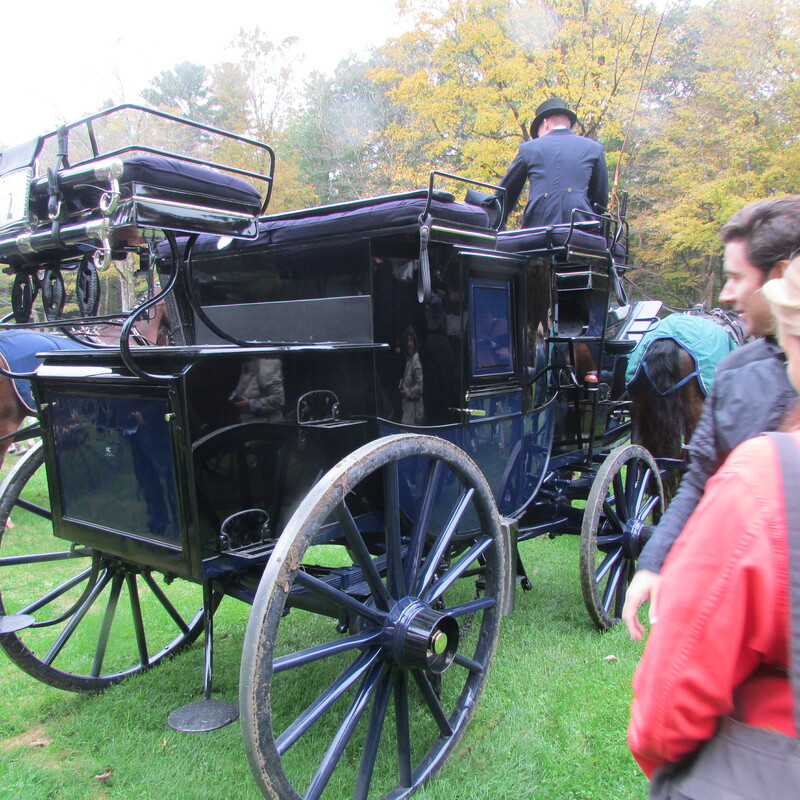 On the third day of the coaching event they drove to the home of Edith Wharton. Edith Wharton (1-24-1862 through 8-11-1937) was an American novelist, short story writer, playwright and designer. She is best known for her books The Age of Innocence, The House of Mirth, Ethan Frome and her book which revolutionized interior decorating opinions from Victorian standards of design to what we think of as correct today, The Decorating of Houses, which she co-authored with Ogden Codman. The photos for this blog post were taken at The Mount. Coaching is a formal event, and passengers are expected to be dressed properly. For ladies, pants or long skirts in conventional colors are recommended. Depending on the time of year, long-sleeved dresses and coats are what is appropriate. Brimmed hats are a must, and if they are decorated with ribbons, flowers, or netting, those adornments add to the visual presentation of the wearer. High heeled shoes are not recommended, as a person has to climb up the coach to get to their seat, and when they alight from the coach they might be walking on damp-soft lawns. When it comes to cool Autumn rides, gloves are a nice touch, but not necessary and warm coats a must, because the ride is long. For Gentlemen, suits or sport jackets, dark socks and shoes and either a long or bow tie are appropriate, but never jeans. Warm overcoat are just right if the weather is chilly. Men must wear top hats or a bowler. Gloves are a nice touch depending on the weather. 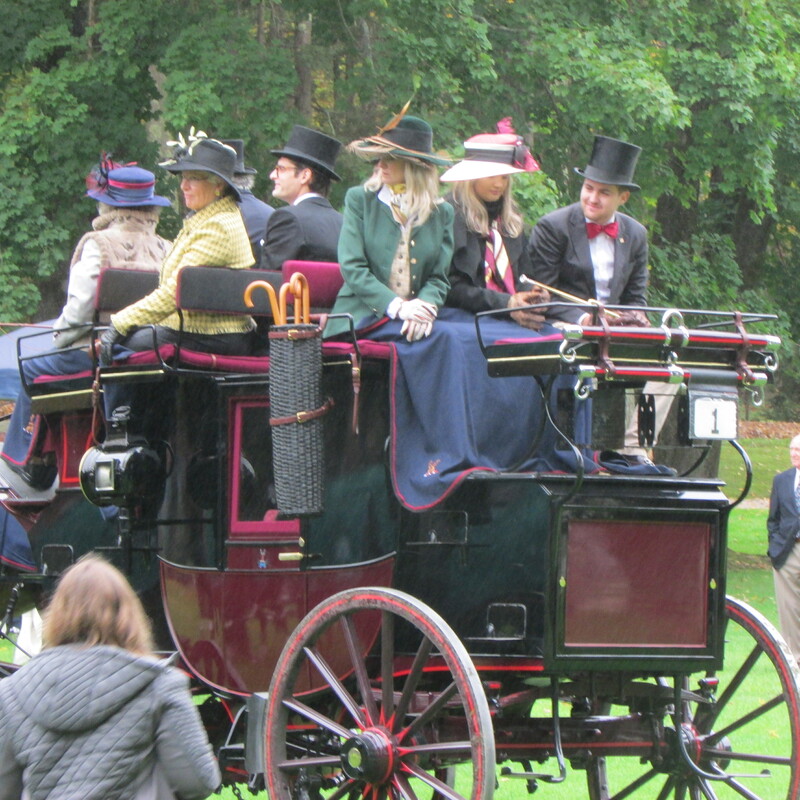 Looking at the above photo, notice that the riders on the coach are covered by a lap blanket. The lap blanket is not a seasonal element, but one that is use year-round, by all passengers, when on a coach. 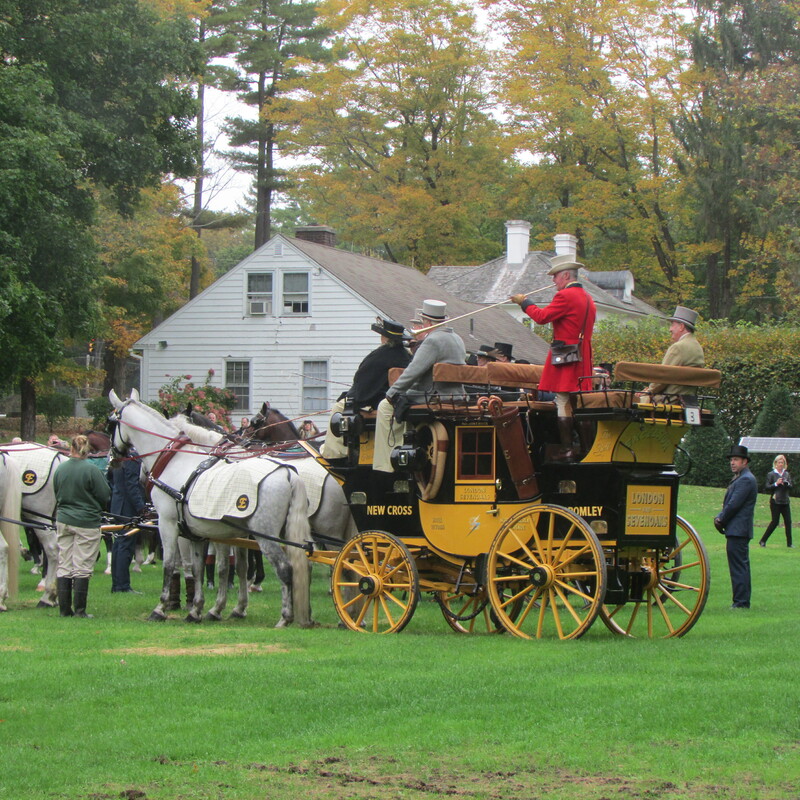 The coaches that came to the Berkshires were based on the Park Drag or Private coaches that were first built for some members of the driving clubs formed in London early in the nineteenth century. The chosen design for coaches during that period were based on a larger version of the Royal mail coach of 1835. These coaches were used by members of two London coaching clubs for attending official driving meets, and were also used for driving to race meetings and other sporting occasions. Here I am with Penny Hunt, she and her husband, John Frazier-Hunt, own the coach we are standing by. 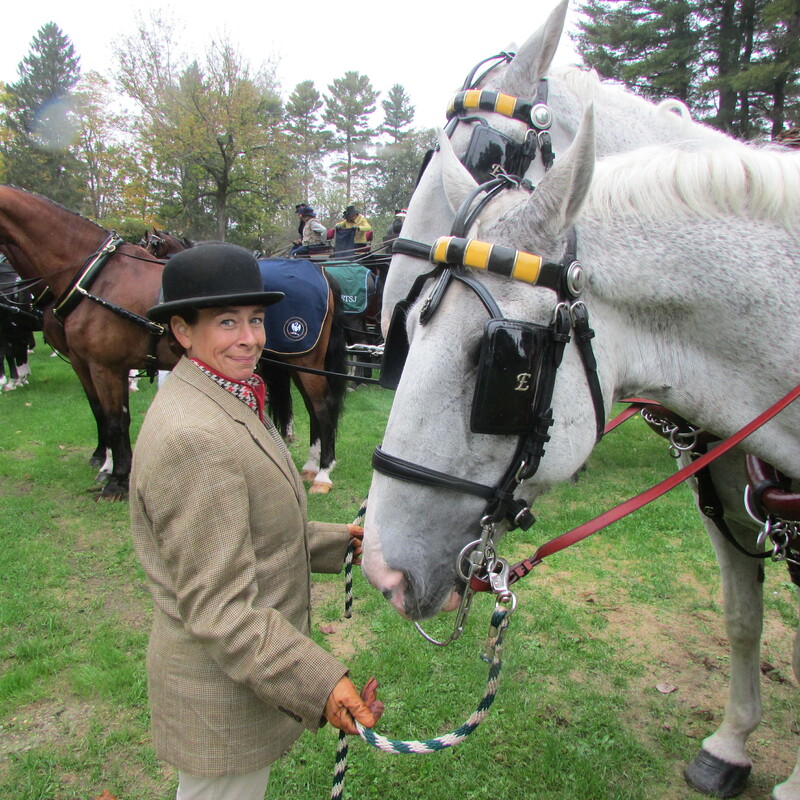 Years ago, up in Saratoga Springs, New York, during racing season, I had the privilege of riding with them, on their coach, when I was on the steering committee for the coaching weekend “An Evening in Old Saratoga”. Penny, consummate hostess, is seen mixes up drinks for her passengers that day. The above two photos shows one of the trumpeter that rides on each of the coaches. The horn blower gives the necessary calls to the road, which could be a signal turn to the right or left, or for others to make way for the coach; these days he is simply there to play music for the amusement of the guest passengers. On the day the coaches came to The Mount, many of the coach trumpeters played their horns for the crowds. 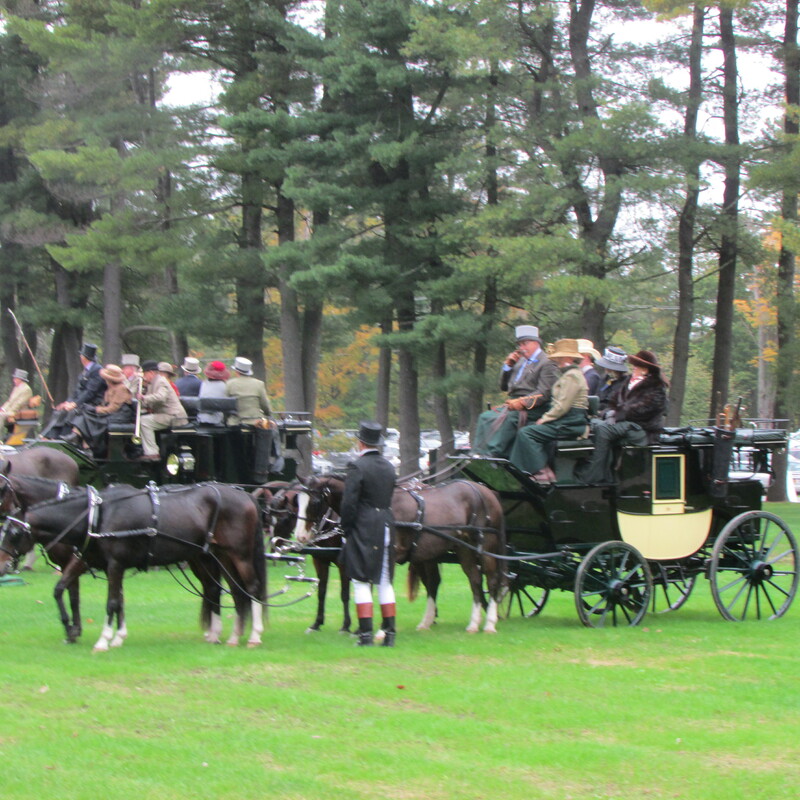 When a coach goes out for a drive, as in the Berkshires, it’s quite a production. Each of the coaches will be historic, and turned out to traditional “Standards”. 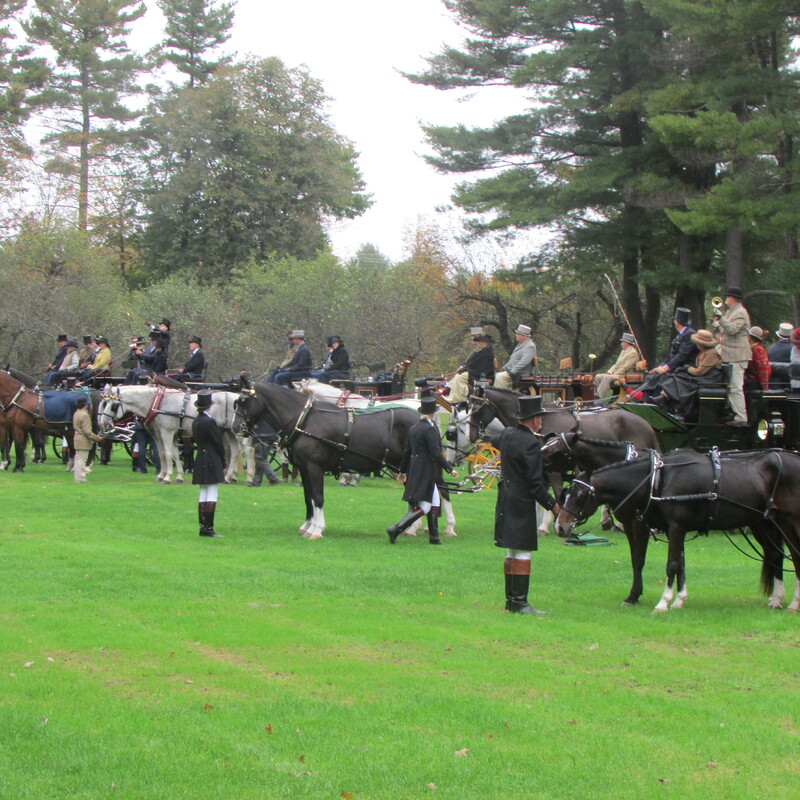 The harness and coach will be highly polished and the horses groomed to perfection. 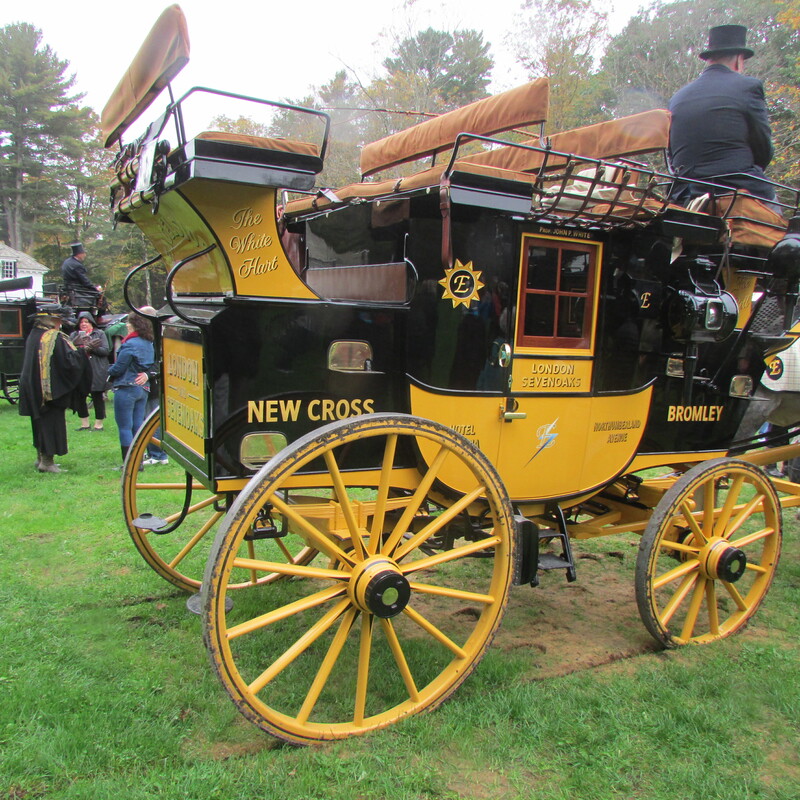 The Whip (driver of the coach and probably owner) will also have two “Liveried Grooms” on board to help with the horses and to assist passengers as necessary. The above photo shows two of the grooms that day, taking care of the horses, while the passengers had lunch in the stables at The Mount. 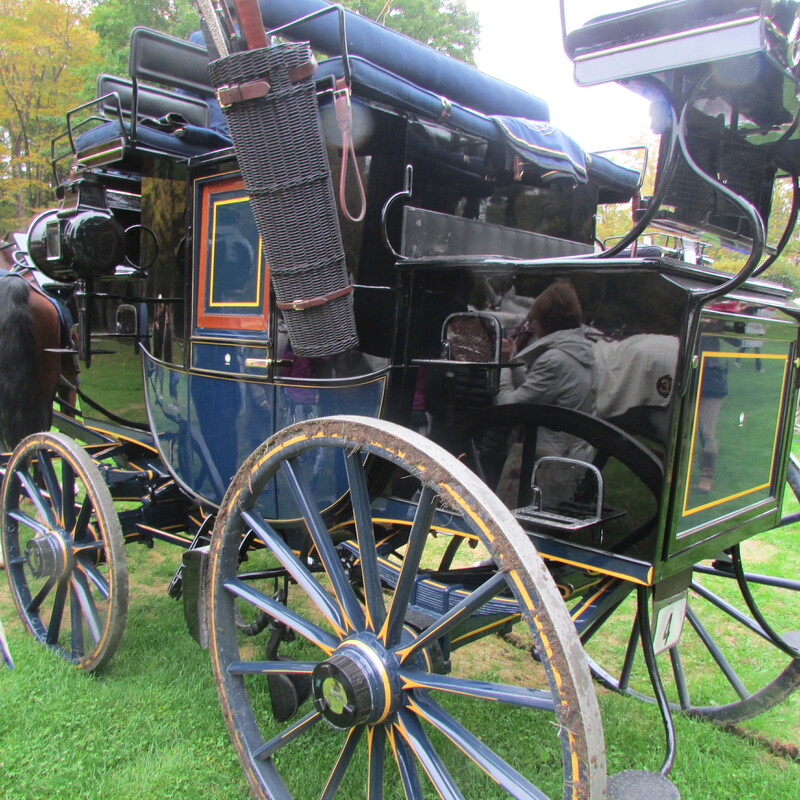 These two photos show the coaches all lined up in a row, with the different trumpeters playing, before the crowds were allowed closer to take photos and examine the coaches close up. 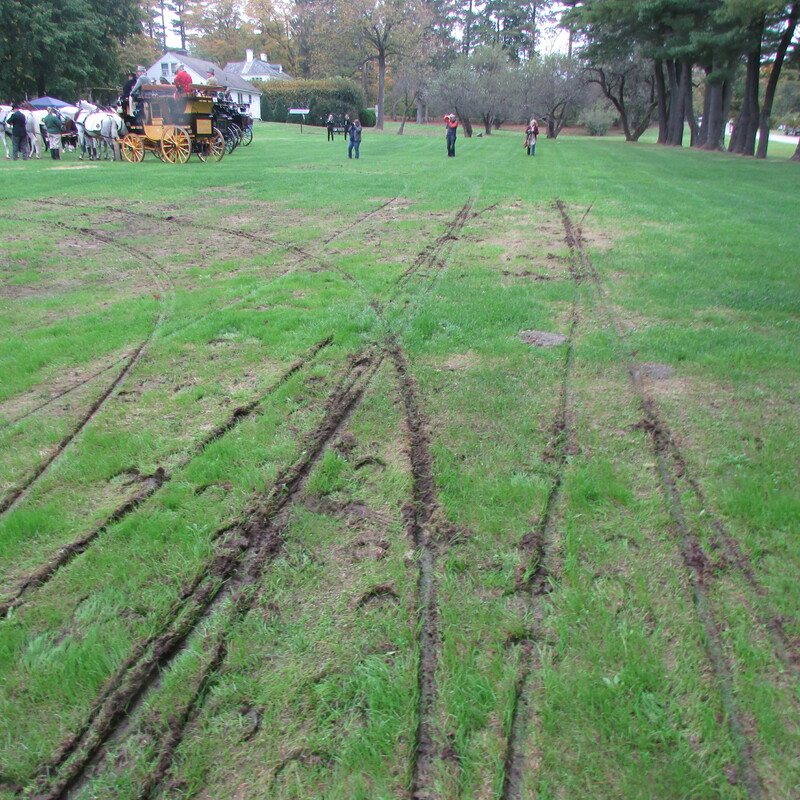 I love the look of the wheel marks and horse hoof prints, seen on the soggy lawn at The Mount; they created a modern masterpiece, of sorts in the grass. 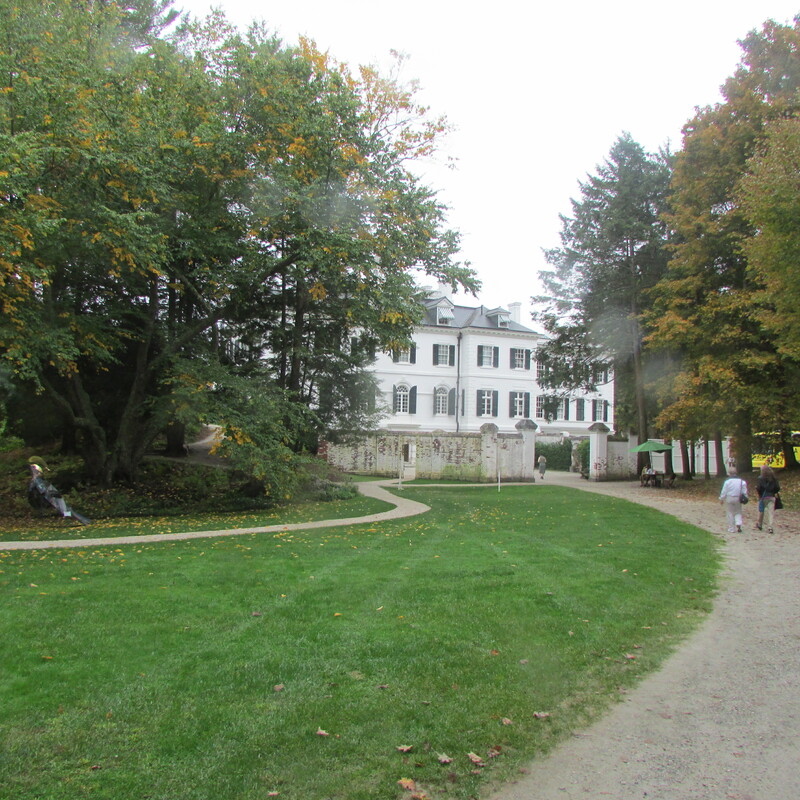 The final photo for this blog post is of the approach to Edith and Teddy Wharton’s Berkshire Cottage, The Mount, seen from the “Motor Court”, front side of the building. A Return Visit to Spencer and Katrina Trask’s YADDO in Saratoga Springs, NY 9-29-2012. This entry was posted in Garden Visits (Road Trips), The Autumn(Fall) Garden. Bookmark the permalink. Hi Fed, loved this.I wish I had known it was going on sorry I missed it. Maybe you could announce events before they happen? Love your blog. Thanks for sending it to me. Ala I wish I had known it was going on sorry I missed it. Maybe you could announce events before they happen? Love your blog. Thanks for sending it to me. ElLen. PS how did you get my email address? 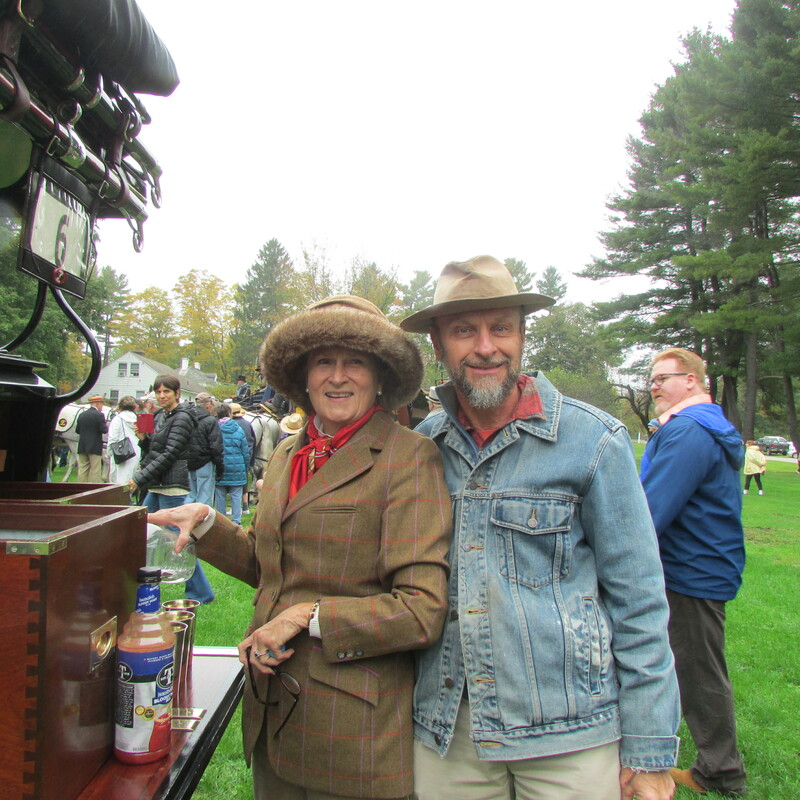 Hi there Ellen, There is another event in the Berkshires that might interest you, it’s called Stockbridge Main Street at Christmas and will be Nov 30, Dec 1 and 2 2018. There is a wonderful house tour and many other things to see and do, here is the link https://stockbridgechamber.org/visit/stockbridge-main-street-at-christmas/ Hope to bump into you during the Troy Victorian Stroll. Fred, I am going to mark my 2019 calendar now so I can go to this next Fall. I love this stuff! I especially enjoyed Edith Wharton’s home…and thinking about all the little dogs she had running around the place. Fred…thank you so much for this wonderful article! 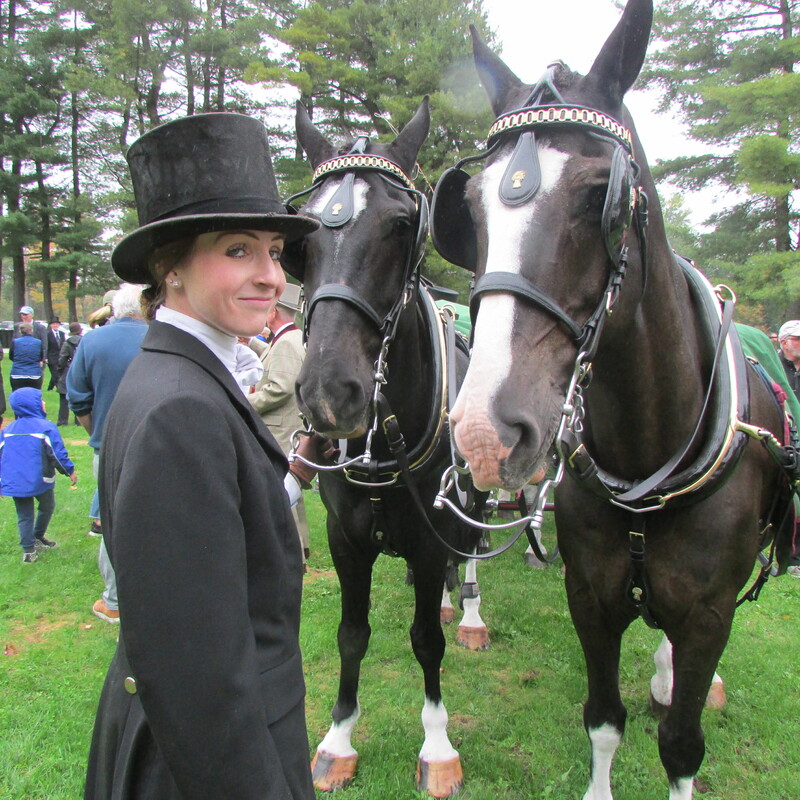 I love all things Berkshires and this event is definitely going on my bucket list for next year. Are the cottages usually open on the day of the event? Also are visitors encouraged to dress in the vintage style as well as the riders? Looking forward to your holiday edition as always! Thank you for sharing this Fred. So amazing to see. Hi there Kim, the coaching events are magical. I’ve, in one way or another participated in them in Saratoga Springs, NY, The Berkshires and in New Port, Rhode Island, and they’re always a wonderful sight to behold. Thanks for your comment, it’s appreciated.